Flashback From 2010: Funny Fireworks! This was from a year ago today, but it's worth reviving for this year, since I laugh so much from the stupid names of some of these products! This week I'm volunteering at a fireworks stand. For those saying "Wow! How? ", let me explain a little. The state of Nebraska allows 10 days per year for free-for-all fireworks sales/use. There are some exceptions: none of this is legal in the Omaha city limits, and Lincoln only allows sales for 2 days. So starting on June 25th, you hear the explosions as everyone's having a good time with their loot. In our neighborhood, it's only really loud till about 10pm...except for July 4th, I know last summer we were launching till midnight, at least! In Bellevue, and perhaps in other cities (but I don't know for sure), local non-profits can pay the licensing fees and sell the fireworks as a fundraiser. I got an e-mail from the Bellevue Soccer Club looking for volunteers to help man their club's fundraiser fireworks stand up the road from us. My first thought? DISCOUNTS! Even though I was TDY at the beginning of the week, and we're leaving on vacation at the end of the week, I still thought it'd be a fun thing to do, so I volunteered to do 2 four-hour shifts. I did my first four-hour shift yesterday and it was fun. Not super crowded, but not bad either. A steady stream of customers. Anyway, the point of this blog post is to share some of the hilarious names for these fireworks. These are all multi-shot small mortar shells. You light it one time and it launches 25 or so shots in succession. Some are benign. There's no doubt what this is, right? Some are sillier. And we start to lose any sense of what's in the packaging. Some are adrenaline-packed! Forget about a description of what this is. And this one made no sense to me whatsoever. Are these even fireworks??? And here are some others...enjoy! This is what much of my drive up I-59 and I-81 looked like last month. If you're unfamiliar with the southeastern U.S., you might have never seen this. Having lived in North Carolina for 3 years, there were areas where we came to expect it. So...what is kudzu? You can read the details, from the taxonomy to the history, on Wikipedia. To summarize, kudzu is an Asian-native vine that was introduced to the United States in the late 1800s and was encouraged as a soil-erosion control near interstate highways. Today, the vine is significantly invasive, covering complete mountainsides throughout the Appalachians. I saw it all over the place on our drive up I-59 and I-81...and it was disturbingly fascinating seeing it in its prime after living in non-kudzu-infested Nebraska for 2 1/2 years. The vines allegedly can grow one FOOT per day...and there are even legends of folks hearing the vine as it grows! It covers hillsides, meadows, trees, buildings, power poles and even electrical lines like an enormous plush green blanket. Kudzu is indeed edible, and on Alton Brown's 2006 television special Feasting on Asphalt, Brown stopped in Cashiers, NC and demonstrated how you can cut the youngest leaves for salad. 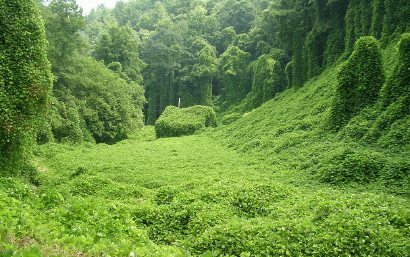 Kudzu is also used to make jelly, soaps and lotions. The Asians have claimed kudzu's medicinal benefits. There's been recent research about letting cattle graze on kudzu, both as an attempt to control the plant, but also for the benefit of the cattle, since it would be cheap, nutritious feed. Others have come up with ways to profit from kudzu. This biking blogger offers some more history and perspective on the weed. In particular like the map he cites showing the kudzu growth areas in the U.S. Yes, these posts are hideously out of order, but I'm writing them in the order of ease of collecting my thoughts. Sorry about that :-) Maybe I'll force the dates around some when I'm all done. We started out in Greenville, SC on the last day of our road trip. It was about 2 1/2 hours to Atlanta and I had the kids think nice and early about what they'd like for lunch. Tangent: I learned this nice and early in our roadtrip -- I let the kids choose at one point and the request was for Taco Bell. I plugged "Taco Bell" into our GPS and we had passed one about 20 miles back...and there were NO MORE Taco Bells on our route for the next couple hours. So I learned to have the kids decide at least an hour in advance. ...and then they requested Chick-Fil-A! Seriously! For my non-US readers, the Chick-Fil-A chicken sandwich was invented in Atlanta. (Okay, actually it was invented in Hapeville, GA, but that's right outside of Atlanta). A light bulb went off in my head! Why not take the boys to the "original" Chick Fil A restaurant. And that's what we did. Luckily, The Dwarf House is less than a mile off our interstate highway route. The Dwarf Grill was opened by S. Truett Cathy and his brother in 1946. It was essentially a basic short-order grill diner, serving basics such as burgers and sandwiches. In 1967 Chick-Fil-A restaurants began to appear in mall food courts, featuring the chicken sandwich that was made very popular at the Dwarf House. The restaurant chain has grown to more than 1,500 retail outlets, in malls, airports, hospitals and stand-alone restaurants. It's one of my kids' favorite places to eat. We got to The Dwarf House right at 11am and we chose to eat in the diner area right in front of the Seven Dwarves animated mural. By the time we left 45 minutes later, there was quite a line to be seated. This restaurant is across from the Delta corporate offices and I'm guessing a lot of the patrons were from there. Note the short front door. There's a regular sized door on the side, but most customers use that little red door, which is about as tall as Timmy. It's a full service diner, made for a nice lunch experience. Along with the other diner fare, you can get the full Chick-Fil-A menu as a "platter" with two sides. This is my yucky iPhone picture of the animated Seven Dwarves. The dwarves are moving along a bicycle-chain-type conveyor from home to the mines. Jacob loves the Spicy Chicken Sandwich. Everything (except the milkshake that you see on the far right) was served on china with real silverware. Timmy got nuggets with waffle fries. The waitress we had was so sweet, I meant to take a picture of her with the boys, but I didn't, sorry. She brought little stuffed cows for the boys after lunch. I asked for a bunch more for Dave's squadron (they use the Holstein cow as their mascot). Road Trip 2011: Vermont Camping Fun & Dump Cake Fun! We had a great time catching up -- we last saw Megan in 2008 and Aidan had grown up so much! Literally, he must be a head taller than Jacob, and they're only about 3 months apart in age. It was chilly and rainy most of the weekend. Every day the forecast called for clearing the next day, but then it remained drizzly and cloudy. Ugh! It cleared up our last evening there, and by then the firewood was too wet to burn. Were it not for the lousy weather, I'd have called it a perfect weekend! The kids got along very well together. 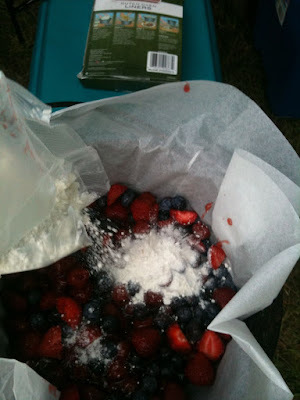 Our trip to the Wanderlust Yoga & Music festival will be saved for another post, but for now here are some pictures of our camping trip, and then enjoy my semi-made-up dump cake recipe for the Dutch oven. Our set up for 3 days. No complaints about our tent or the temperatures. At least it wasn't a cold rain. The canopy was a godsend for keeping the table dry for meals. This is a white admiral butterfly fluttering near the fire ring. Common in New England. Jacob and Aidan were teaching Timmy how to play catcher. We purposefully chose a tent site near a field so the boys could play baseball. They played for hours all weekend...this was a game they were playing as soon as they woke up, they're in their pajamas still. Our one and only hike at Townshend State Park, which was cut short due to the trail crossing a creek that was running so high and fast I didn't trust Timmy making it across. Dave had the good camera, all of these camping shots were taken with my iPhone. Since the hike was cut short, the boys could spend extra time skipping stones across the creek. Since it was too wet to make a fire for the hot dogs, we used our camp stove. Corn steaming on the left, dogs/brats and rice pilaf (cooking on the backpacking stove on the right) for dinner. Now that you're drooling from our camp dinner, let's talk about what we did for dessert. I had brought along my Dutch oven. I have a 10" Lodge footed Dutch oven with a brimmed lid. I've owned it since 1997 or so, it's been great for Civil War reenacting meals and with enough care, I've been able to use it to cook on modern family campouts too. Because of the lousy weather, Megan and I weren't sure whether we'd use the Dutch oven at all, but on Sunday at the grocery store, I quickly grabbed some cake mix and pie filling and decided to throw together an easy dump cake. 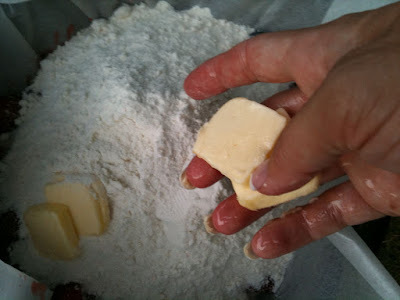 I recalled this popular dump cake recipe, which I'd seen variations of many times, so I brought it up on my iPhone while in the grocery store and did my best to remember the ingredients after I lost the signal. Except I forgot about the pineapple. 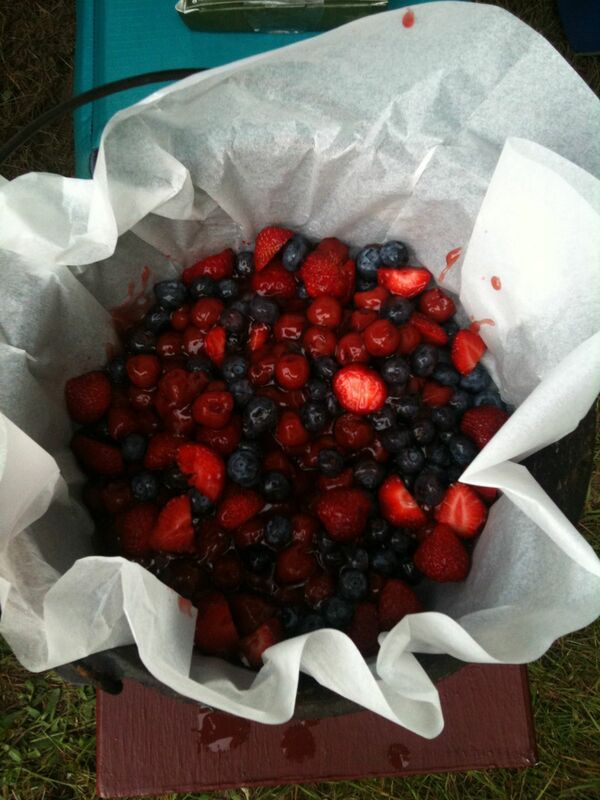 That's okay, because we had strawberries and blueberries. And cut one stick of butter into 8-12 pieces. "Dump" the cake mix on top of the fruit. Then dot the mix with the pieces of butter. Like my berry-stained hands??? Do your best to even things out, but I was seriously winging it here so pardon that this isn't very pretty. Now what? Before I "dumped" the ingredients into the pot, we had fired up a pile of charcoal briquettes. This website provides some great tips on how to convert the amount of heat you need into the number of greyed-over briquettes. 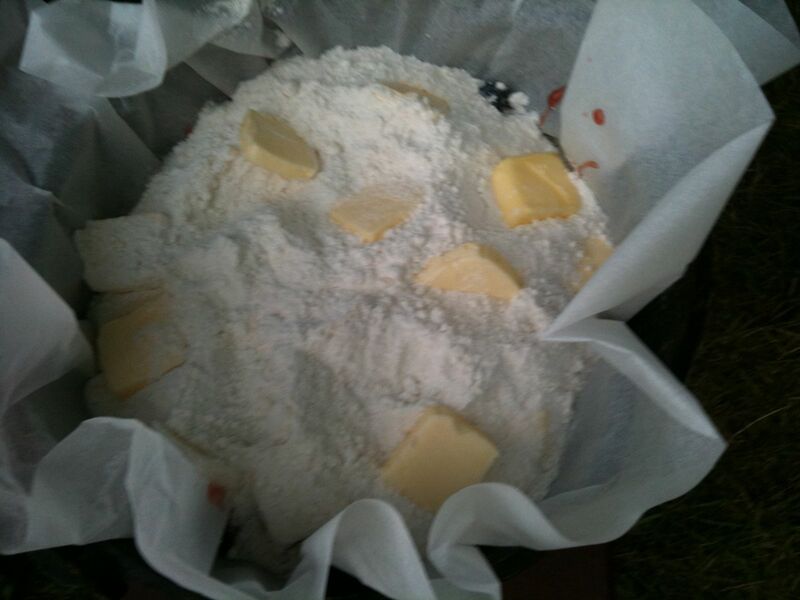 Since I've baked cobblers and biscuits in this Dutch oven many times, I remembered that I needed 24 briquettes, with 14 on the top and 10 on the bottom, to replicate 350F for 30-45 minutes. Set that in your campsite fire pit and go enjoy your dinner! The parts of the Dutch oven right over/under charcoal briquettes will become local hotspots, so it's important to rotate the oven every 15 minutes or so for even baking. Turn the lid 90 degrees AND rotate the oven over the top coals by 90 degrees in the OPPOSITE direction. A nice big closeup pic for your enjoyment. The butter melts and combines with the cake mix and fruit juices to make this super-sweet gooey dessert! Now I wish I had at least picked up a tub of Cool Whip or a can of Redi-Whip....this was SO SWEET! But delicious! 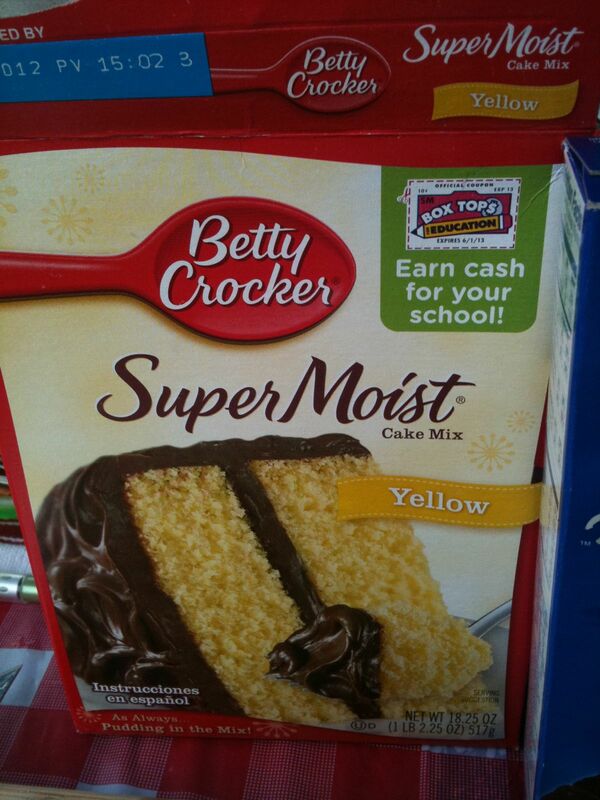 Sadly, this was our leftover cake. It's very very rich...a little goes a long way. Megan was able to pick up the whole piece of parchment and plop it into a storage container to take home the following morning. We had an invitation up to visit a famous (in N-scale model railroading circles) basement model railroad in Lewistown, PA, while we were in Hershey for the N-Scale Convention. I asked if we could "swing by" Penn State at least for lunch and some souvenir shopping. Lewistown is about 1/2 hour southeast of Penn State. 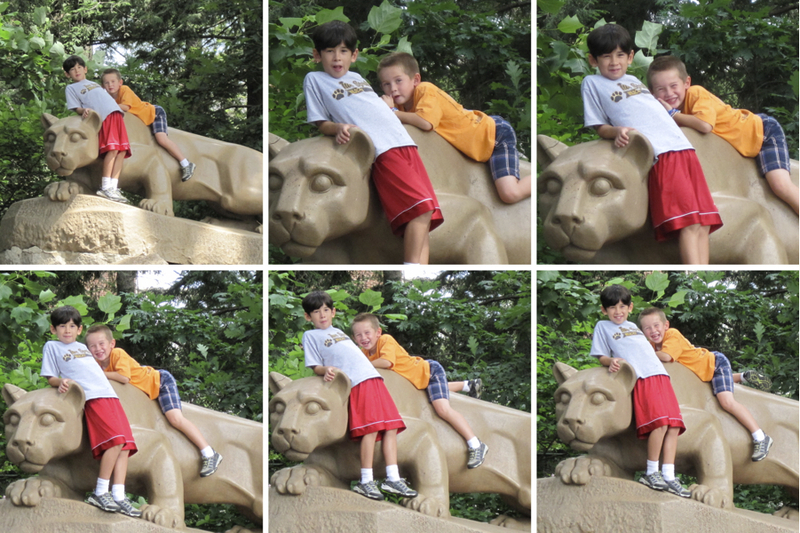 We had a good time, with lunch at The Corner Room, stops at our favorite souvenir stores (Student Book Store, Family Clothesline and McClanahan's), and of course pictures at the Nittany Lion! The boys had fun posing all over the lion. Then we used a nearby garbage can as a poor-man's tripod to get a nice family shot. I was quite impressed! We wrapped up our short visit with a trip to the Creamery*...yum! I'm a bad bad Penn State alumna -- I didn't bring PSU clothing for the boys on our trip. They didn't get new t-shirts until about 2 hours after this picture. This fine photo is courtesy of a well-placed garbage can near the Lion. The route we planned from Florida to Pennsylvania took us right across some of the destruction paths from this past spring's Tornado "Superoutbreak" of April 25-28. On this trip I crossed three of this past spring's tornado paths, each are discussed below. While part of me as a "weather weenie" finds a fascination in getting to see a tornado in action (I've never seen one...but that's for another discussion), I also find incredible sorrow in seeing what can get left in it wake and the pure helplessness society experiences about it. You rarely can get more than 10 minutes' notice once landfall has been detected, and if the tornado is large enough (such as with Joplin, MO), even 10 minutes won't help save your valuables; the best you can do is protect yourself. The pictures here are not mine, we proceeded so quickly through each of these areas I didn't have the time to get the camera ready. This experience also had me thinking about those poor folks who were innocently driving on I-59, I-81 or I-91 and suddenly a tornado screams across in their path! I also thought about all the victims, dead and alive, and the families dealing with the aftereffects. Our thoughts and prayers are with you all. About a week before I left for my vacation, a college friend had sent me some pictures from his trips to Joplin, Missouri to help clean up. Joplin, Missouri. This isn't my friend's picture, but his are VERY similar! After this once-in-a-generation awful tornado season, here's hoping for a safe and effective cleanup and recovery. The Red Cross is still working with victims of all these storms -- please take a moment to consider helping out, either by donating supplies through a local charity collection, or else via the American Red Cross website itself. You can also text "REDCROSS" to the number 90999 for a quick and easy $10 donation to be added to your cell phone bill. This is a contribution to their generic disaster relief fund, which is also supporting the midwest flooding and southwest wildfire relief efforts. We weren't expecting it, but as we proceeded northeastward up Interstate 59 in Georgia, we pass through the small town of Trenton that's abuzz with bulldozer and crane activity. The trees that lined the interstate were destroyed. We see piles of rubble on top of foundations. Zipping by at 70+ mph, we saw it all so fast, it was tough to process what we had seen. Two were killed in Trenton, GA. I had a little bit of Fujita-scale forensics education in college, so I remember that piles of rubble on foundations being indicative of strong EF-3/weak EF-4 damage. I looked up the details of the storm and the National Weather Service, Peachtree, GA office actually tracked not one but TWO tornados through Trenton, GA during the April 2011 superoutbreak. Look for the "Dade/Walker" tornadoes in the far northwest corner of Georgia on the interactive map. On I-81 in extreme southwest Virginia, as the sun was setting, the family was admiring the orangeish glow on the mountains to our east as we drove through the Blue Ridge Mountains. Then we see a swath of dead trees cut into the side of the mountain. And again with the bulldozers! This was the town of Glade Springs, VA, which experienced an EF-2 tornado the night of April 27th. Another tornado damage path across the interstate??? This one really took me by surprise, since I made a last-minute decision to take I-91 straight south through Massachusetts out of Vermont on Monday. On June 1st, a tornado struck downtown Springfield, killing 4 people. The National Weather Service confirmed it as an EF-3. Reminiscent of the aftermath of the 2004 hurricane season that our family experienced, just south of downtown Springfield, blue tarps dominated the rooftops. Once again we were greeted with the telltale broken tree trunks and blown over road signs. The track of the storm was nearly perpendicular to I-91. I was thinking about how old the town of Springfield, Mass. is and how old many of those buildings must have been. Statistically, such strong tornadic thunderstorms are rare in New England. I've never done a "Wordless Wednesday" before, but I thought we'd have a good time with these pictures Dave and I took of Amtrak's 40th Anniversary exhibit train at the Strasburg Railroad in June, pulled by a P40 locomotive. Considering these to decorate Jacob's room, since he's a fan of Amtrak. We had our truck about 14 months before learning about the "Average Fuel" setting that ties to the trip odometer. Yep...that's the total number of miles driven on our two-week road trip in the lower right. And, as an added bonus, we have the average mileage. That'll come in handy for some additional calculations. Let's check out some more numbers. You guys know me and numbers, right? I have quite a list of forthcoming blog posts about the assorted adventures we had over these past couple weeks! Stay tuned!